So, how’s April looking? Need a few more dates for the old calendar? We reckon we might be able to help. Simply read on and see for yourself. Sometimes it’s nice to celebrate the stranger things in life, and they don’t come much stranger than John Waters and his gloriously barmy filmography. He’s dark, subversive, funny, moving, and endlessly compelling, and you can catch three of his greatest hits at the New Globe this month. The first is the newly remastered Multiple Maniacs (1970), Waters’ first ever feature film. The second is Pecker (1998), in which unassuming photographer Eddie Furlong accidentally becomes the latest New York art snob darling. The Fest closes out with 1981’s Polyester (complete with Odorama, naturally), Waters’ twisted, morbidly comic send-up of suburban Baltimore. If you’re even remotely interested in cinema, it’s not to be missed. Most of us don’t take enough time to simply sit back and appreciate what it means to be alive. Fortunately, there’s now an entire festival dedicated to doing just that. Live Large Festival is a celebration of life and diversity in all its forms, and the organisers have made a tremendous effort to ensure that its accessible to everyone, no matter their specific needs. There’s a stuffed program of entertainment, including William Barton (didgeridoo maestro), Three Handed Beat Bandits, and Rudely Interrupted, with Tim McCallum on hand to make sure everyone’s up for it. Food comes courtesy of such icons as Carolina Kitchen and The Bun Mobile, and there’s tons of stuff for the kids to get stuck into as well. We’re not really sure what we can add to “Free Grilled Cheese Day Laneway Party” that could convince you any further, because it’s the greatest phrase ever coined by man. But we could tell you who’s organising it, we suppose. 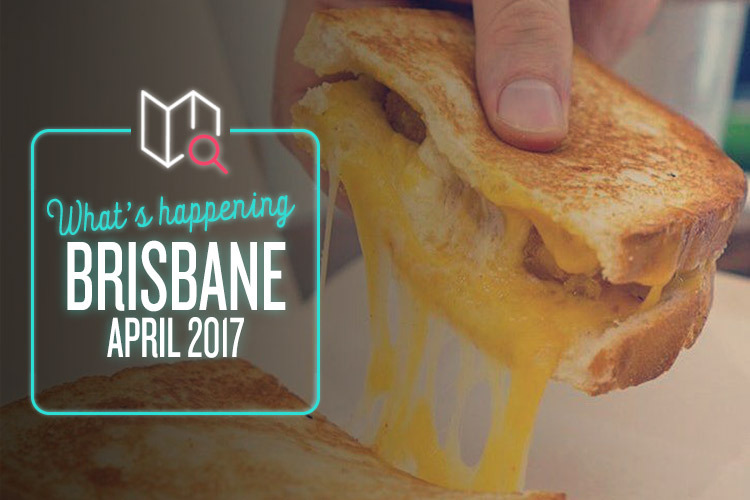 That would be Melt Brothers, Brisbane’s legendary dedicated cheese toastie haven. All you need to do is like their Facebook page and follow them on Instagram, and you can simply stroll down between 10am and 12pm on April the 8th for your free toastie. Will you choose the three-cheese “Mouse Trap”? The ham, cheese and relish “Holy Cheesus”? The vegetarian “Hippie Cheese”, or the mac ‘n’ cheese, maple bacon-stuffed “M.C. Cheesy”? Decisions, decisions!